I fell down the stairs when I was two or three years old and somewhere along the line I got the idea that my brother was the culprit, that he shoved me down the steps from the landing. Was I standing at the top of the stairs, tottering around, out of my mother's sight? I have no idea. I have no memory of the fall at all, the landing I create in my imagination is dark oak or sometimes it's simply depression-era brown paint on cheap floor boards, a thin and faded floral carpet tacked down over it. That's how memory works, a vague haze that we color in with details from other times and places; most of the landings I've seen have been the ones in old movies. None of it can actually be true, certainly not that my brother, the naughty little devil—one of the epithets my mother would call him—did it. What is true—according to my mother—is that my grandmother had to push my loosened teeth back into place. Russell would have been no more than five or six at the time. I've never really believed that he did it, deliberately toppled me. It's not just that I don't want to contemplate the possibility—which I don't—but at the same time it's not as though it would be completely out of character. When we were kids Russell would attack my sister and me, appearing from behind a doorway where he'd been hiding, waiting for the perfect opportunity, sticking his bony fingers into our ribs, maniacally cackling Its time for Mr. Tickles. But it didn't tickle, it hurt. He routinely trundled us up in our family's Turkish carpets and rolled us around on the hardwood floors. When my sister was still small and light enough, Russell would grab her by the ankles and swing her over the toilet like a pendulum. She loved every moment of it. Just as clearly as I remember being trapped inside the sweltering darkness of the rug—the smell of it, hot and acrid, the wool fibers of the carpet scratching at my skin, until he finally set me free and I emerged pink and sweaty—I can also remember running to hide behind my brother's back whenever I was frightened. I've got the photographic evidence to prove it, black and white snapshots of Russell and me at Trafalgar Square, pigeons flapping everywhere, and there I am cringing behind him. 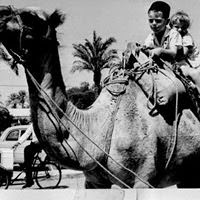 As little kids in Tripoli, Libya we rode a camel together—the way that other kids might ride ponies in the park—the camel's hump swaying wildly from side to side with every step. I held on tighter than tight, tiny fingers clutching at his shirt, whimpering—or was it wailing?—until the ride was over. Growing up, I took his white knight status as my protector for granted. Like little sisters everywhere, I trailed along with Russell whenever he'd allow it, usually when none of the guys were around. With adolescence came separation but while I no longer trailed after him, I knew if I needed him, he'd be there. At twenty two, when my marriage of six months turned out to be the mistake everyone knew it would be, my brother and my father fetched my belongings from the Santa Monica cottage I shared with my husband. Phillip (not his real name) had dragged me into the house and thrown me across the bed when I came home late from the Fourth of July fireworks show. I was afraid he'd hit me, instead he'd said I had thick ankles. I never wanted to see him again. After I graduated from college and moved to San Francisco, my brother had to come up to the city to rescue me again when things with my podiatrist boyfriend didn't work out. Russell drove me home down the 5 to Los Angeles, all my belongings stuffed in a small U-Haul we trailed behind us. My brother has always been there, taking his big brother responsibility seriously. As children back in Canada, our dad was frequently off on business trips so he was used to being the man of the house in our father's absence, the little boy who was told to look out for mummy and your sisters when I'm away. He's turning another year older this Sunday and since we're celebrating his birthday this weekend, I got to wondering if Russell actually knows how I feel about him. How much I love him and appreciate him. I don't want to get saccharine, he'd despise that. I'm sure he thinks I write a lot of sentimental crap as it is. Just one last thing then. When my son was a baby—not quite one—we started out on the two hour trek to my husband's familial home in Grand Terrace for his parents' huge Christmas Eve holiday party. I knew from experience there would be thirty five to fifty people there. Our car was packed with presents for assorted nieces and nephews: a Fisher Price easel for one of his nephews, a Nerf football for another, Barbie dolls for the nieces, Play Do sets, golf paraphanalia for his dad, a cozy yellow sweater for his mom, fluffy pink slippers, picture frames and boxes of See's chocolate for the confusing collection of family friends who might or might not stop by. Presents that would all have to wait for another day to be delivered because we ended up breaking down on the freeway, stranded just about halfway between Los Angeles and the inland empire. Back in the days before cell phones were ubiquitous, it was after ten by the time we found a mechanic and a telephone. Mark called home where the party was in full swing, his father said no one could come to rescue us; no one was still sober enough to safely drive. We moved to plan B. I called my brother and on Christmas Eve, he drove out once again to rescue me. No grumbling, that I recall. He simply did what brothers, good brothers, do. And that's all, really, that I wanted to say. In case he thinks I don't remember everything he's done for me, I do. So true, we don't tell each other often enough how we feel. What a sweet story and a dependable big brother. I'm sure he's lucky to have you too.